A certificate issued by the Kantei Club is attached. 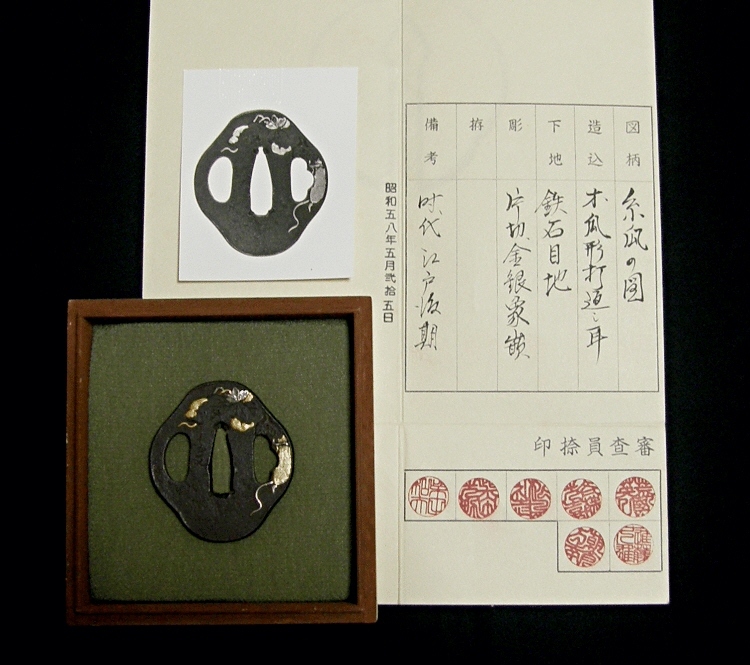 According to the certificate, this tsuba was certainly made by the founder Katsurano Sekibun, well-known as a master tsuba craftsman. 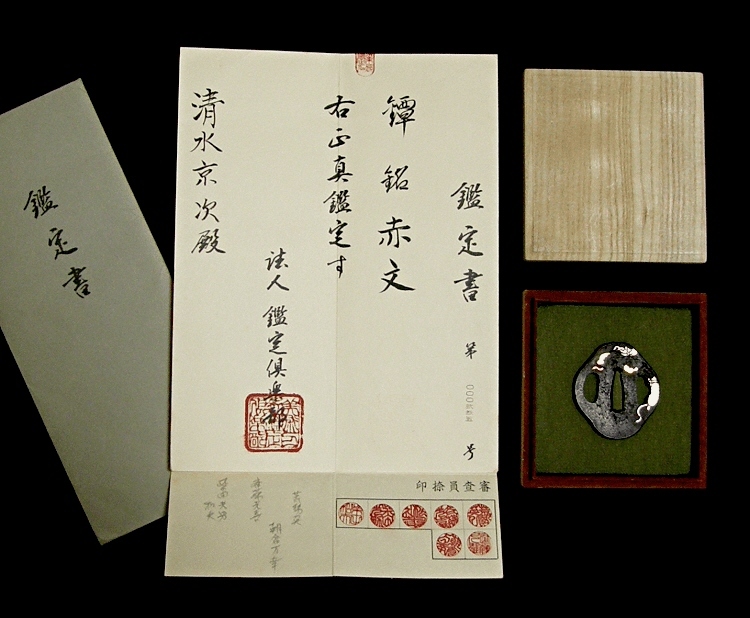 From the certificate, we can find seals of appraisers such as Mr. Shibata Mitsuo, Arase Eiichi, Saito Mitsuki, Matsushima Toshio, Shibata Kazuo and Asakura Banko. These men are all board members of the Business Cooperative Association of Japanese Swords. Especially, Mr. Shibata Mitsuo is an appraiser of great distinction for swords and sword guards. 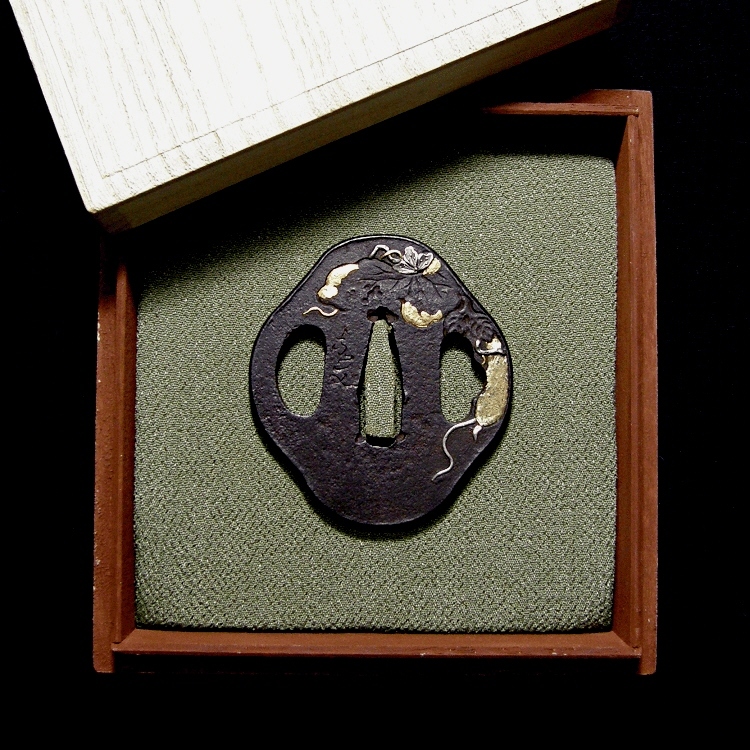 This tsuba was authenticated as a genuine Sekibun by these highly-reputed appraisers. 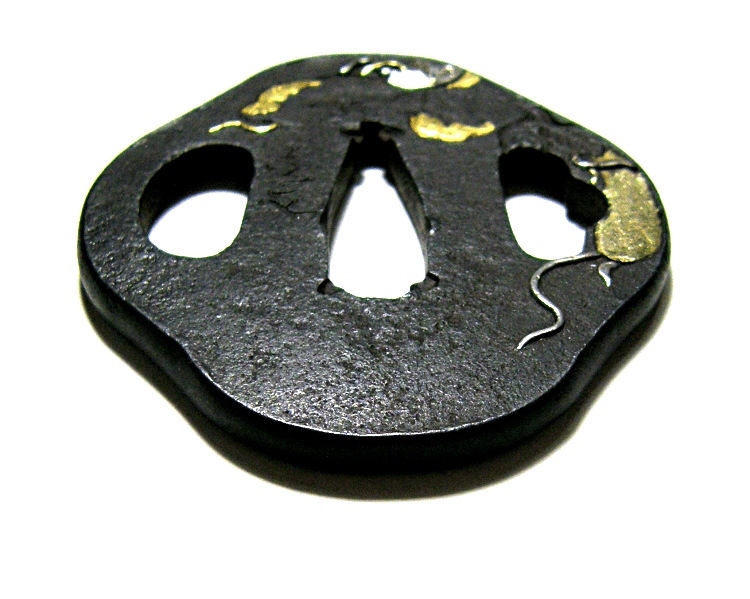 The tsuba is made of iron, the surfaces are processed like stone (=Ishime-ji), this kind of shape is called "Otafuku-Mokko-Gata". 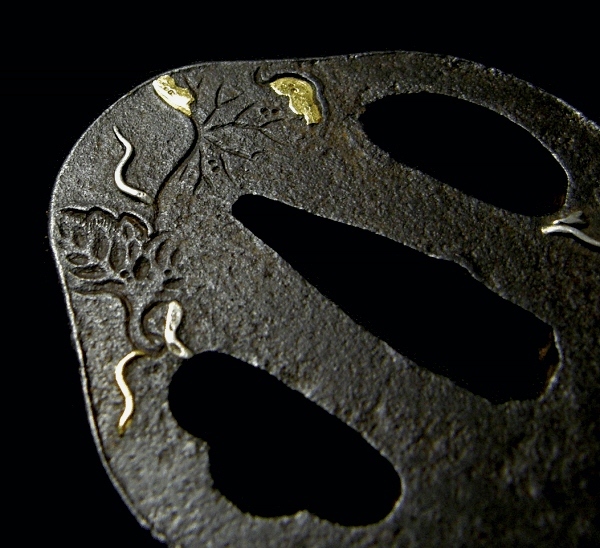 Loofah gourd is expressed in the Katagiribori carving, the Iroe and Zogan inlay methods with gold and silver. The rim part (Mimi) is hammered back (=Uchikaeshi-Mimi). It is slightly rusty, however, the color is nice as it is forged well. The 1st Katsurano Sekibun is superb master craftsman. 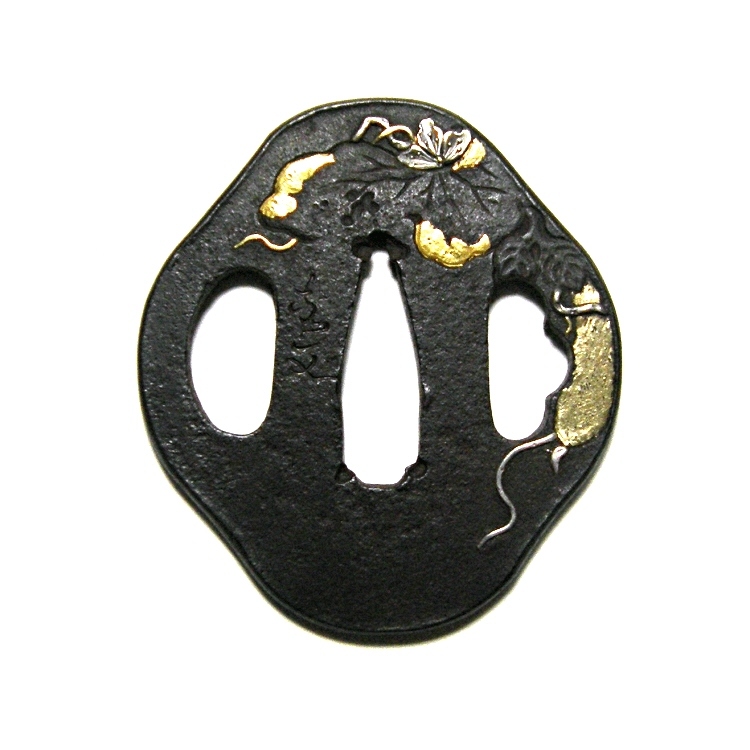 This tsuba is his genuine piece of work authenticated by the highly-reputed appraisers. His given name was Shozo. Born in 1789 at Murakami of Echigo Province. 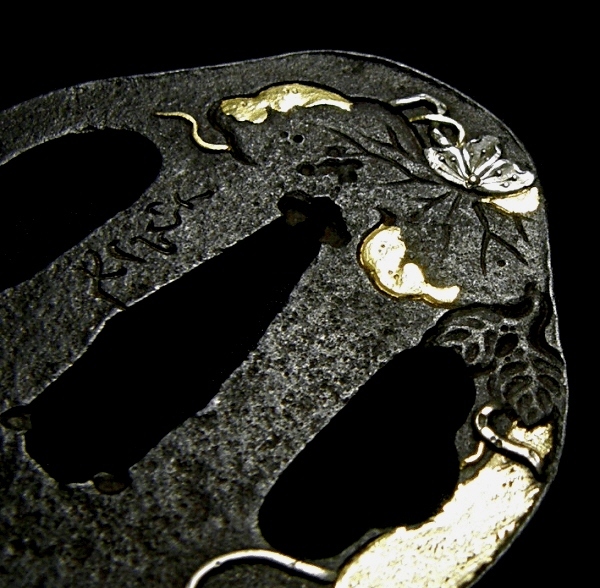 In his youth, went to Edo and learned metal carving under the Hamano school. He also went to Kyoto to learn metal carving. At the age of 36, became an officail craftsman for the Sakai daimyo family of Shonai Domain. When he was 57, moved to Tsuruoka town of Shonai Province. Especially good at expressing animals, butterflies, insects, flower & leaves, figures on iron or Shakudo plates in the Takabori carving. Ranked as a Superb Craftsman on the Craftsmen Directory. 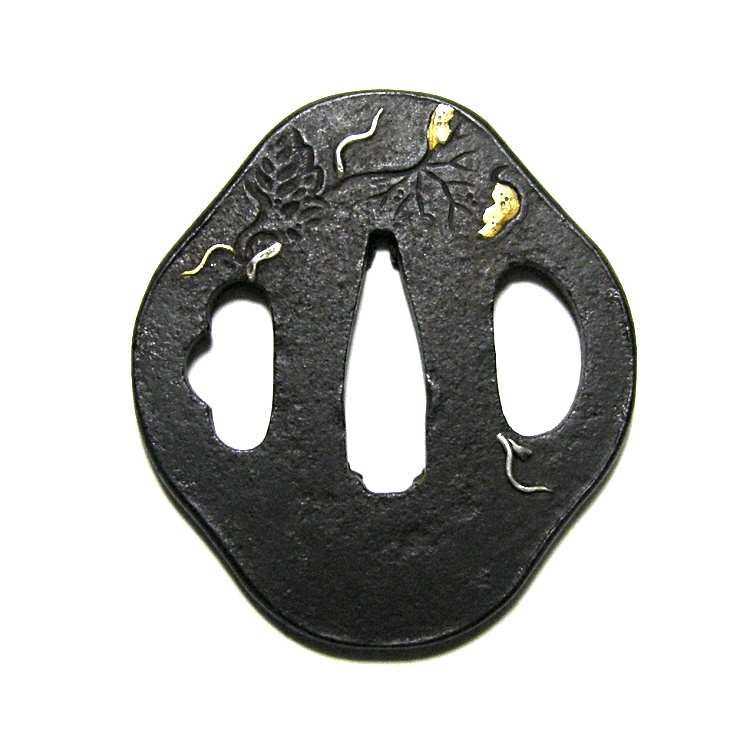 This tsuba is made of iron. Tempered well. This kind of shape is especially called "Otafuku-Mokko-Gata". Loofah gourd is expressed in the Katagiribori carving method. It looks like painting with Japanese brush. It is Iroe inlaid with gold and silver. The rim part is hammered back.